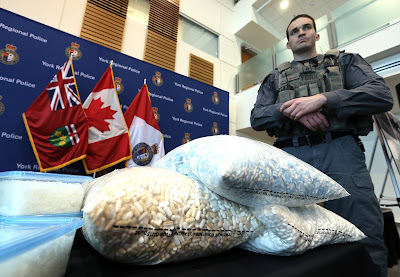 Police have busted an Ontario “super lab” and seized $5m worth of drugs in the biggest meth haul the force has ever seen. York regional police’s organized crime bureau executed six search warrants across the region after receiving a tip about suspicious dumped material. Twelve vehicles as well as Canadian and U.S. cash were also seized in the raids. The lab could produce multi-kilo level of synthetic drugs. 8 are facing charges including production of a controlled substance, possession of the proceeds of crime and possession of meth for trafficking. Dubbed 'Project Discard' cops seized more than 21,000 kg of toxic waste and 50 kg of meth.